VALDIVIA, Chile, February 28, 2014 (ENS) – Endangered blue whales and 12 species of dolphins will flourish in the waters of south-central Chile after the government this week inaugurated the largest Marine Protected Area in continental Chile. Chile’s President Sebastián Piñera, Wednesday visited the Bay of Tic-Toc to inaugurate the new Tic-Toc Marine Park, as part of Chile’s Bicentenary Legacy program. The reserve spans a marine area of 87,500 hectares, stretching from Punta Yeli to Punta Guala on the southern border of the Los Lagos region. From now on it will be used only for scientific and recreational activities; all industrial activities are prohibited. “We are not only fulfilling our international commitments, but also our duty to our children and grandchildren to care for, preserve and pass on to them this wonderful country which God gave us,” he said. The Chilean President also set aside the Pitipalena Marine Coastal Protected Area in the southern area of Punta Guala on the northern edge of Melimoyu Bay. There, only certain productive labor as agreed with the community of Puerto Raul Marin Balmaceda, will be permitted, such as the sustainable extraction of sea urchins. Located off Chile’s southern coast, the new Tic-Toc Marine Protected Area is an important feeding and nursing ground for the blue whale, the world’s largest mammal. The primary target species of modern whaling, the blue whale was reduced to very low levels in all waters until protected in the mid-1960s. The species is showing some signs of recovery in the Southern Hemisphere and North Atlantic but generally remains at very low levels, according to the International Whaling Commission. Feeding on tiny crustaceans called krill, blue whales can grow to weigh 120 tons and reach a length of 25 meters (82 feet). They migrate to polar waters for feeding in the summers and back to warmer latitudes for breeding in the winter months. Tic-Toc was established in one of the most biodiverse areas of Chilean coast. In addition to blue whales, unique species of dolphins such as the Chilean dolphin and Peale’s dolphin, as well as two endangered species of otter are found in the Tic-Toc Marine Protected Area ecosystem, says the global conservation organization WWF. The achievement is the result of 15 years of work by several conservation groups to protect the waters against threats such as overfishing and aquaculture activities. “This marine park is a gift and a great inheritance for our children,” said Dr. Francisco Viddi, Marine Conservation Program coordinator at WWF Chile, who helped to further this conservation effort. 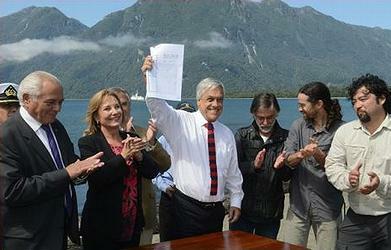 Along with Tic-Toc, the government also approved the designation of a Marine Coastal Protected Area further south in Aysén. Both efforts will help to consolidate an important pole of conservation in the area, said Dr. Viddi. “Tic-Toc will finally be protected; its rich waters, innumerable species and fragile ecosystem will be conserved and the blue whales will continue to have a home here every summer,” he said. 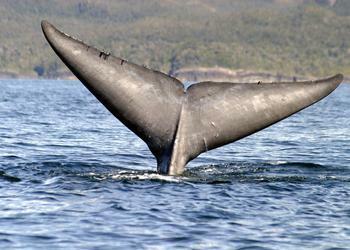 WWF-Chile has worked in the area for almost a decade carrying out research on key marine species. The group’s ongoing projects include blue whale satellite tracking, dolphin habitat monitoring, promoting better practices in salmon farming and promoting sustainable ecotourism. Originally promoted by the Melimoyu Foundation, this initiative was advanced by the efforts of WWF-Chile, the Blue Whale Centre, and the Austral University of Chile. “Chile urgently needs a network of marine protected areas along the coast, and the Tic-Toc Marine Park and the Aysén protected area opens the door. We hope that they serve as a model to be replicated in the rest of the country,” said Carlos Cuevas, founder and director of the Melimoyu Foundation. The new marine park will remain in the custody of the national fisheries service, which will be the body responsible for establishing a management plan.